I was actually rather late to the party on Newsies. I remember seeing commercials for it when I'd get the Disney channel preview back in the day, but it didnt interest me. So I didnt bother to see it. Then I came to MIT, got waaaaay deep into musical theatre, and made some friends who adored this film. It was only a matter of time. There's just so much to love about Newsies. I think my single favorite element (at least at this exact moment) is the choreography. Sure, Kenny Ortega has a certain repuation nowadays (meaning post High School Musical). But there's no denying that he is a genius at what he does. Keep in mind, I'm a dancer, so I know these things. There's few choreographers that can effortlessly create unique movement. Personally, I believe that the majority of choreography is derivative, recycling what you've seen and learned before. The ones who are able to create something new are the brilliant ones, and that's what Ortega does in this film. Exhibit A (skip to 2:15). Exhibit B. The music is great too. Its so catchy and fun. Said theatre group does a cabaret night twice a year where we perform songs for funsies. A few years ago, a bunch of us girls threw together "Carrying the Banner". We only worked on it for about 2 hours day of, but had such a blast. I was Crutchy. And that stupid accent stayed in my head for weeks afterwards. More positivies: the story is simple, but compelling. I adore the characters, 'specially Crutchy, Cowboy, and Mush. And oh yeah bite sized Christian Bale. A few other gems worth sharing. During their down time, some of the boys filmed a slasher movie on the set called Blood Drips Heavily on Newsies Square. Be warned, its only worth watching if you're a Newsies fan. Remember, it was made by kids, so without the context, you wont appreciate it. 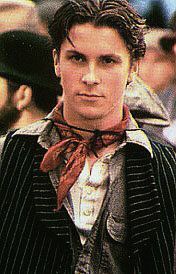 And speaking of bite sized Christian Bale, I came across this clip while looking for Blood Drips... It always shocks me hearing his real accent.